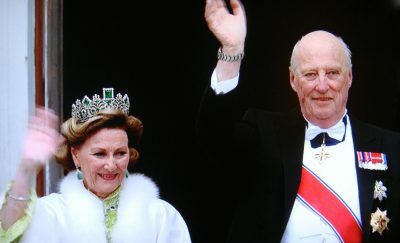 SEE THE VIDEO: An estimated 3,000 Norwegians streamed to the Royal Palace in Oslo on Tuesday evening, to pay tribute to King Harald and Queen Sonja as they began official celebrations of their 80th birthdays. 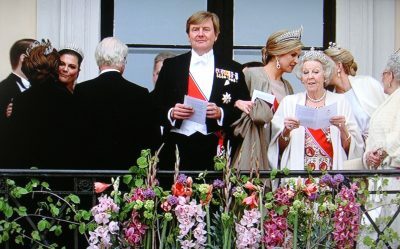 Those defying chilly temperatures and the threat of rain on the palace grounds also got a glimpse of royals from all over Europe, who appeared on the palace balcony before heading indoors again for a gala banquet. Party at the palace from newsinenglish.no on Vimeo. The commoners showing up on the palace grounds were treated to free ice cream cones (appropriately called Krone-is, from the days when they only cost one Norwegian krone, or crown) and some warm-up entertainment by the King’s Guards, who have won many a Military Tattoo for their precise marching, music and drill team expertise. Then came the high-energy Oslo Soul Children’s choir who also tried to warm up the crowd, while young trapeze artists performed on the sidelines. Norway’s royal family is widely acknowledged as an anachronism from days gone by, but the country’s constitutional monarchy has strong support from 81 percent of the population, according to the latest survey conducted when King Harald actually turned 80 in February. 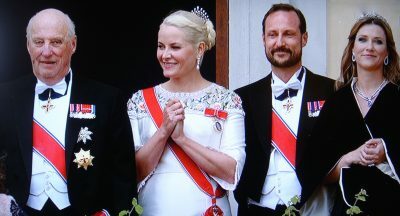 Among its supporters is Christina Sedler, who brought her 11-year-old son Sean to take part in the festivities on Tuesday: “I want to hang on to the Palace and the traditions around it,” she told newspaper Aftenposten on Wednesday. “We’re proud of them,” echoed Sean. Canons were roaring from the Akershus Fortress again on Wednesday, when the royal couple and their royal guests set off at 11am on a “mini-cruise” around the Oslo Fjord despite chilly temperatures and steady rain. The weather was not cooperating with the royal birthday celebrations, but most all carried on. Festivities would continue Wednesday evening, with the biggest royal motorcade since the last royal wedding in Oslo, as guests are driven through the city to the Opera House for a government-hosted dinner. It was all set to end with fireworks at 10:30.